Of Smetana’s nine operas, only The bartered bride has ever entered the mainstream of international opera houses. Of the remainder only Dalibor has ever even troubled the fringes of the repertory outside its Czech heartland. Even Dalibor has had an uphill struggle. It was roundly condemned by many of the composer’s contemporary critics for its supposed Wagnerian influences. In his booklet note with the Onyx issue under consideration here, Jan Smaczny describes the reaction of the early critics as “idiotic flapdoodle”, but there are places (particularly in the First Act) where there are clear echoes of the score of Lohengrin. This can be heard in the fanfares preceding the entrance of the King, and Dalibor’s apostrophe to the soul of Zdenek. Only after some years, and the composer’s death, did Dalibor establish its status as the Czech national opera with a reputation as a patriotic treasure. Indeed it is the operas of Janačék, after an equally unpromising early performing history, which have served to establish Czech opera as a force to be reckoned with internationally. Dalibor has often found a welcome home in Britain, and with the BBC in particular. The two sets under consideration here, made a full sixty years apart, both derive from performances sponsored by the BBC. Between them they serve to illustrate the considerable differences in approach to the music over the years. 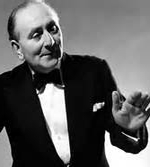 The 1955 broadcast here derives from a set of acetate discs made by the conductor Vilém Tauský. The BBC actually made two recordings of the work in one week, and both were broadcast on the Third Programme with the second relay continuing right up to 10.50 at night. The Radio Times for that week supplies some further information missing from the documentation for this re-mastering. The English translation was made by Humphrey Procter-Gregg. The leader of the orchestra was Maroug Parikian on 5 May replaced by Max Salpeter on 8 May. The repetiteur was Bryan Balkwill. The chorus was trained by Leslie Woodgate and both broadcasts were produced by the light music composer Mark Lubbock. This additional information, and the final BBC announcement giving the name of the leader of the orchestra as Max Salpeter, confirms that this recording is of the second broadcast on 8 May, although the brief notes with the issue confess unwarranted uncertainty about this. The BBC let Tauský tackle Dalibor again in 1969 and this was issued on Gala. Richard Lewis in the mid-1950s was quite a phenomenon. He never made any recordings of the mainstream romantic operatic repertory. His appearance as the Steersman in Antal Doráti’s London-based Decca recording of The flying Dutchman a singular exception. He was indispensable in the concert hall and the fringes of the central opera tradition. 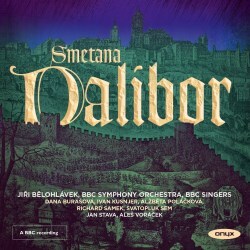 In the six months prior to this BBC recording of Dalibor he had created the leading tenor roles both in Walton’s Troilus and Cressida and Tippett’s The midsummer marriage. The existing recordings show how marvellous a job he made of both of them. He recorded Gerontius (twice), created the part of Nero in Raymond Leppard’s edition of Monteverdi’s Coronation of Poppea, and can be found on various pirated recordings of repertory ranging from Mozart to Berlioz. The role of Dalibor fitted his strong lyrical tones, which could also encompass real heroics, like a glove. The rest of this 1955 cast is something pretty special, too. Joan Hammond was by this stage coming towards the end of her career, but her steadiness of production is welcome in the part of Mlada where we too often are afflicted with Czech sopranos of uneven quality. Hammond also scores by her close observations of Smetana’s copious markings of expression in the vocal line. She even manages his cruel demands for a crescendo after a sff attack on high notes, with thrillingly dramatic results. The secondary soprano role of Jitek is taken by no less an international artist than Suzanne Danco, whose command of English is excellent and whose tone quality is superlative. She and Hammond conjure up a positive storm in the Act One final scene. Dennis Noble could sometimes be rather gritty in tone especially (as here) in his later years, but his legato is true and he makes a good fist of the vengeful King. Alexander Young is fine as the feckless second tenor, but the real star of the supporting cast is the genial gaoler of Stanley Clarkson, a singer of whom I am ashamed to say I had never previously heard. He has fine diction, a good sense of line and even essays an unwritten C below the stave at the end of his solo scene. It is just a pity that this passage is spoilt by some clear wear on the acetates at this point. That wear, coupled with what sounds like some overloading on the microphones themselves, is a far greater problem on the second CD with the duet between Dalibor and Milada showing distinct signs of distortion on the voices. There is even some evidence of rapid adjustment of recording levels in the final pages. Also, oddly, the first twenty or so bars of Act Three are missing from the recording. The orchestral and recorded sound on the new Onyx recording is clearly streets ahead of the 1955 sound, but it is interesting that the entirely Czech singing cast are generally far less careful in their regard for Smetana’s dynamic instructions in the vocal part. At several places marked contrasts between piano and forte are simply ignored. Nor are the voices of Richard Samek and Dana Buršová in the two principal roles anything like as heroic as their predecessors, less conventionally forthright and concentrating more on the lyrical shading of their lines. On the other hand there is none of the unsteadiness of delivery which afflicts other performers on any of the four Czech studio recordings that have been available over the years. Jan Stava as Benes does not match the lyrical bass lines of Stanley Clarkson on the earlier set and he does not make any attempt to provide a low C. Alžběta Poláčková is rather more conventionally piping as the shepherd boy than Suzanne Danco, but otherwise there is not a great deal to choose between the two casts separated by sixty years in time. What is more surprising is that the older set has a greater sense of dramatic involvement, even extending to the provision of some sound effects to heighten the sense of tension. Then again the score really does benefit from the sounds of the Czech language. The rather less barnstorming approach of Jiři Bělohlávek perhaps fits the music better. There is here again an odd omission: at the beginning of the second CD there are twenty-four bars missing from the orchestral interlude (Tauský has them), which sound suspiciously like an editing error in the transfer. If so, it really should be corrected. Also both Samek and Buršová duck the top C at the end of their Act Two duet which Lewis and Hammond deliver so gloriously. We do however get the prelude to Act Three at its full length without Tauský’s inexplicable cut. CRQ do not provide much in the way of supporting documentation, not even a cover illustration, track-listing or synopsis. However, anyone purchasing this set will presumably already own another version to which this English-language performance will be a supplement. Those who complain about indistinct delivery of lines in English by modern performers may care to note that audibility was also a problem in the 1950s although this may be the result of Smetana’s decidedly noisy scoring. Less than half of the text is audible with any degree of clarity. Onyx provide a booklet containing a synopsis in three languages, and the libretto complete with translations is available on line. English-speaking listeners unfamiliar with the opera will thus be more readily able to follow the plot than when it is sung in their own language. Ironic. One wonders whether the English National Opera production from 1976 — with John Mitchinson and Anne Evans in the leading roles conducted by Sir Charles Mackerras — did any better; it was at one time available on the Oriel label. The latest of Supraphon’s four sets (Smetacek, 1979) remains listed in the current ArkivMusic catalogue, but otherwise the only rival shown is sung in German, a live performance from the Vienna State Opera (available in two distinct transfers) starring Leonie Rysanek and Ludovic Spiess under the baton of Josef Krips. Quite apart from the question of language, that recording is effectively ruled out of consideration by the fact that the conductor has hacked over a quarter of an hour of music out of the score. Dalibor is a through-composed score which needs to be heard complete without pettifogging cuts. No, given the Slavonic wobbles that afflict all too many of the voices on the Czech language recordings which have been available over the years, new listeners may well find the new Onyx discs provide the best way to make the acquaintance of a major romantic opera which deserves to be better known. They may then wish to investigate the vintage Tauský recording as a possible supplement, and certainly as an intriguing alternative view of how well the BBC did such things sixty years ago.